Why Sears Hometown & Outlet? Sears is one of the most trusted and preferred brands in retail and has a long time tradition of serving America. 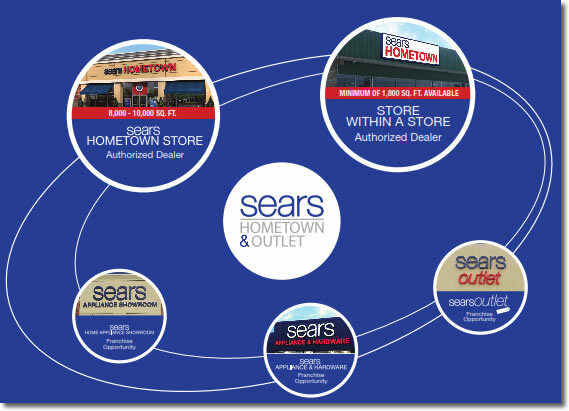 Sears Hometown and Outlet Stores, the parent company, has several retail franchise and non-franchised dealer store concepts in the market today. Friendly, knowledgeable store owners and store managers proudly serve local communities and offer in their markets the largest selection of home appliances; tools; lawn and garden equipment; Sears brands including Craftsman®, Kenmore®, Diehard®, exceptional customer service; price match guarantee; credit; delivery; installation services and protection agreements. Sears Hometown and Outlet Stores are backed by the strength of the Sears name and brand which has served and been trusted by generations for more than 125 years. Starting your own business can be both a rewarding and complex process. As one of America’s premier retailers, Sears Hometown knows what works and what doesn’t. Unlike many other franchises and dealer concepts, Sears Hometown offers smart business models that allow you to do what you do best – develop and maintain relationships with both customers and the community. There is a low cost of entry; no franchise fees, license fees and no inventory or transportation expense. Sears Hometown isn’t just another retail franchise or licensing opportunity. We are America’s brand. Our various store formats set the standard of excellence for quality and dependability for millions of households across the United States. Hometown Stores – Prospective owners who wish to open a new store must have a minimum of $20,000 cash and a positive net worth of at least $100,000. Sears Hometown Stores range from 8,000 to 10,000 square feet with approximately 70% of the space devoted to selling square footage. The actual square footage of your store will vary by the size of the market and availability of real estate. Minimum building front must be at least 55 feet with windows. Ceiling height must be between 10 ft. and 14 ft. Based on our experience, the estimated start-up cost for opening a new Sears Hometown Store is between $60,000 and $85,000, plus recommended operating capital. Actual expenses are dependent on many factors including the square footage, merchandise assortment and geographic location of your store. Store Within A Store Space Requirements – Sears Hometown is looking to partner with strong suburban or rural businesses that have home goods product offerings aligned with the Hometown Store’s assortment and at least 1,800 square feet of selling area available within their existing location. This dealership opportunity allows independent furniture, ﬂooring, hardware and related home category store owners to expand their product lines to better cater to consumer demand. Merchandise options include an appliance only format or appliances with tools and lawn and garden equipment. The estimated start-up cost for opening a Store within a Store is between $26,000 and $32,000. 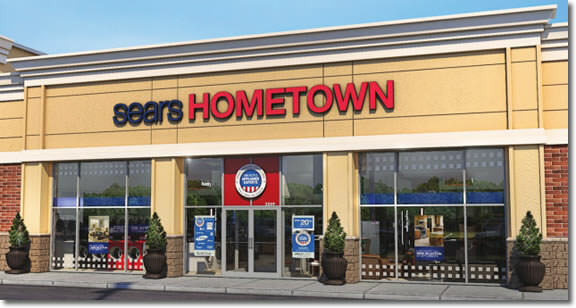 Buy An Existing Store – Established Sears Hometown Stores are available for purchase through existing owners. Negotiations and agreements to purchase an existing store are solely between the owner and prospective buyer. However, Sears Hometown Stores must ﬁrst grant the candidate approval, based on their qualiﬁcations to own and operate a Sears Hometown Store. Qualiﬁcations will be determined during the recruitment evaluation process. Our team will assist you in either reviewing your current business location, or locating real estate that meets with our approval. Your responsibility is to secure property either by lease or ownership. We are with you through the retroﬁt or building stages and as you prepare your store to open for business. *Permits, real estate costs, taxes etc. will vary by state and municipality. What qualiﬁcations are essential to become a Sears Hometown Store owner? The ideal owner candidate is outgoing, results-oriented and committed to success. You need to be able to motivate and manage employees and have a good basic knowledge of business and ﬁnancial principles. You may beneﬁt from previous management and sales experience. Do I pay any fees or royalties to Sears Hometown Stores? For Hometown Stores and Stores within a Store there are no fees or royalties. The inventory remains under Sears Hometown ownership; so there are no inventory costs. Proﬁtability varies depending upon a number of factors including: the amount of sales, store location, number of households in the market, operating expenses, lease/real estate costs, and your ability to manage and control the business. Can I hire a manager for my store? Yes. The owner is responsible for all employee and staffing decisions. Do I provide a location and the building? Yes. Our team will assist you in ﬁnding a location and facility that meets with our approval. Market requirements and your resources will determine whether you will buy, build or lease your facility. What kind of assistance do I receive in planning my store? Our team will guide you through the market analysis, site location, lease negotiations, and construction/retroﬁt. We will also provide instructions on ﬁxture set up and merchandising the store and help prepare for the opening. Our dedicated training staff will instruct you in the day-to-day operations and management of your store. Initial training will take place in one of our Certiﬁed Training Stores, operated by our best Sears Hometown Store owners. Next, you will be ready for an impactful week of training in our Training Store in Dekalb, IL and our Headquarters in Hoffman Estates, IL, where you will learn in-depth information about selling skills, commissions, advertising, operational processes and merchandising your store. Our training also includes extensive online learning through our Inspired To Learn web based training system designed for both the owner and their employees. This system provides monthly training packets with specially featured products or services, our Sales Today digital publication with product information/selling strategies and much more. Note: Always seek the advice of competent counsel regarding any legal and ﬁnancial issues.